Make a Difference. Leave a Lasting Legacy. Harbourfront Theatre has woven a rich history of arts and entertainment into the community and has much to be proud of over the last two decades. Looking ahead there are so many experiences yet to be had, so much untapped talent just around the corner, and so many artists, emerging and renowned across this country and beyond yet to invite to the stage. But we cannot and do not continue in our mission of expanding the cultural opportunities available to residents and visitors of our community without your support. 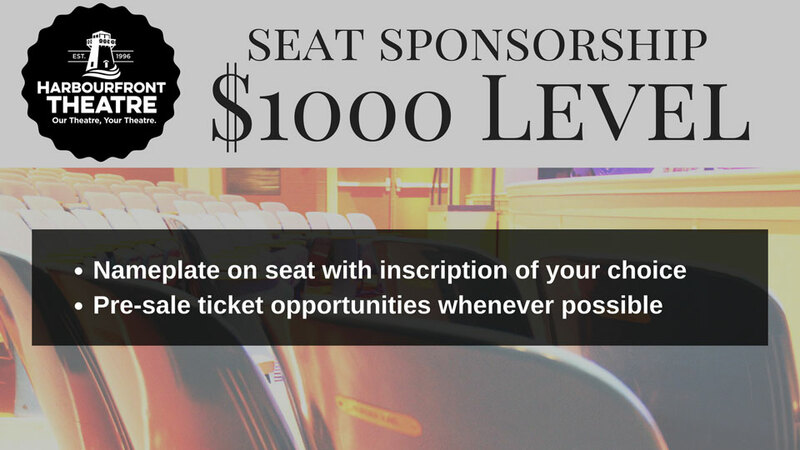 Therefore, friends of Harbourfront Theatre have embarked on a Seat Sponsorship Campaign to help ensure a strong future for our theatre. Seat Sponsorships play an important role in the continued preservation of Harbourfront Theatre where every dollar makes a difference. Theatre credit for $500, redeemable for tickets. For more information about sponsoring a seat, contact Kieran Keller (kieran@harbourfronttheatre.com) or Mary Dennis (mary@harbourfronttheatre.com) by email or by phone at 902-888-2787. Download an info packet about the Harbourfront Theatre Sponsorship Campaign here.